Carrying your food and drinks in a cooler box can be quite heavy on your arms, so by putting it all in the best backpack cooler bag, you can take the strain of your arms. Although an insulated backpack cooler will keep food and drinks cool for a few hours, it won’t be that effective for longer journeys. For longer car journeys where temperatures can sore right up to the 30’s, it’s best to buy a car electric cooler box as well. This will keep the contents properly chilled as it runs of your car’s cigarette lighter. The contents can then be transferred to a backpack cooler bag when you leave the car. In addition, it’s also ideal for bringing to the park if you were planning just to have a little picnic or have a feast with a portable BBQ grill! Keep your drinks and food cool for hours, but don’t worry about having to keep your hand in the cold for too long while rummaging through – the bag can open like a lid, so that you can just pick it right out! Lots of space – you can carry up to 28 litres, or alternatively, a case of beer (20 cans) and two bottles of wine. Three inner pockets can be used as extra storage to insert chill blocks, your personal belongings, or whatever you want. Use the versatile removable shelf to separate your items or create a dry area. 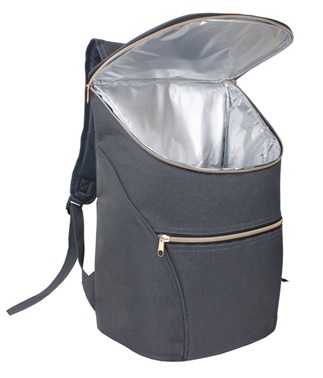 Also features a separate wine cooler, a mesh side pocket to store some extra bits and bobs, as well as a strap to carry a bottle or rug. Why not use this bag as a carry on bag for your trips too? This bag can be used for more than just keeping your drinks cool. Doesn’t have external zipped pockets. 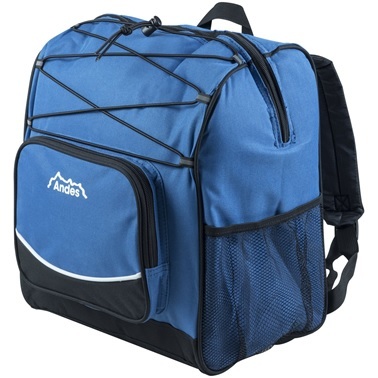 This extra large rucksack cooler bag can carry a lot. Whether you wish to carry 28 litres or 20 cans of beer and two bottles of wine, you will definitely note this bag’s extreme storage space as one of its best features. Asides from that, you can keep everything organised in the bag with a removable shelf and also not have to worry about spending ages rummaging through the bag, thanks to its lid-like opening. 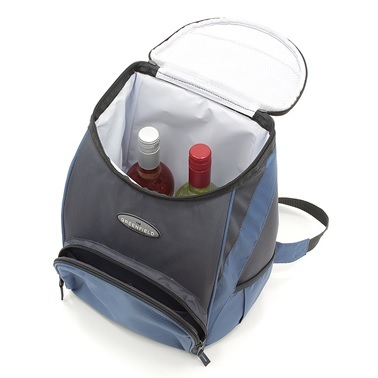 Additionally, this bag comes with side mesh pockets and a separate wine cooler. Has a capacity of 20 litres and can store a large number of items! Lightweight and doesn’t require much space – can be folded up when not in use. Has an aluminium foil insulated lining that ensures that your items will be kept cool for up to four hours. 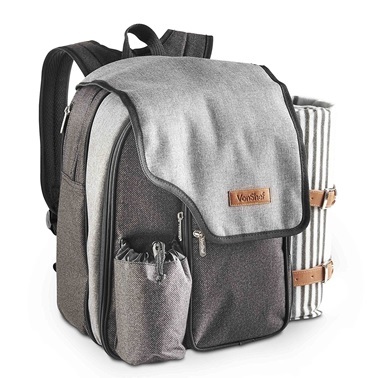 This stylish backpack has two pockets – the larger one where you store all your large items and a smaller external pocket to store the small things. Take this bag with you on hiking trips, picnics, sport events – wherever you want! JSK’s stylish insulated backpack cooler is lightweight and can be folded up when not in use, so you don’t have to worry about it taking up too much space. It is insulated with aluminium foil that helps keep your items cool for up to 4 hours. Store all of your smaller items in the external pocket and upto 20 litres in the bag itself. Suitable for many occasions, so you don’t have to go out of your way to buy several bags for several situations. Has two compartments, many pockets (mesh, drawstring, and zipped), as well as straps on the side to tie in a blanket. Stylish, but also useful – can carry a lot at the same time as keeping everything cool, thanks to the aluminium foil insulated lining. Both the rucksack (which is made of a durable, but soft flannel effect polyester) and the gigantic blanket are waterproof. Includes: 2 x stainless steel knives, 2 x forks, 2 x spoons, 2 x washable cotton napkins, 2 x plastic wine glasses, 2 x BPA-free plates, salt and pepper shakers, large plastic chopping board, a corkscrew and bottle opener, and a picnic blanket. Quite small, so wouldn’t be able to carry much. Perhaps there’s no need to buy a separate 2 person picnic basket set or waterproof picnic blanket as this premium finished, insulated backpack cooler comes with an entire picnic set, as well as lots of compartments and pockets within the bag to store them! You can keep your items cool for long in this bag with thanks to the aluminium foil insulated lining, and you don’t have to stay indoors when it rains because this bag (as well as the blanket) is waterproof! Additionally, this bag is made of a durable, but soft to touch flannel effect polyester, so your bag can handle carrying lots. Can carry up to 16 litres, so is great for a day. Has several pockets, which is great if you love being organised. Made from high quality materials, making the bag durable, but also lightweight. Main compartment is fully insulated and can keep food and drinks cool for 5 to 7 hours. 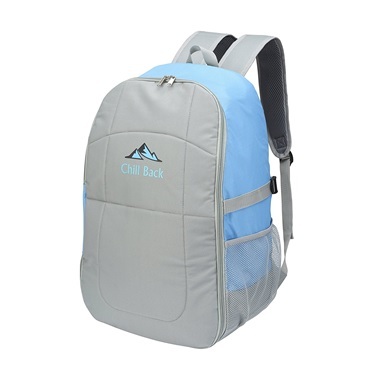 Breathable padded sections on straps and rear of bag ensures comfort. Doesn’t have a carry loop. Comfort is one thing that some of us value above all else. Fortunately, this rucksack cooler bag has padded straps, which ensures that your shoulders won’t ache as soon as you shrug on the backpack. Asides from comfort, though, this bag can keep your items cool for 5 to 7 hours with its fully insulated main compartment. And, you can store items in an orderly fashion, thanks to the number pockets! Has a capacity of 25 litres. Keep your foods and drinks cool in the large, insulated main compartment. Store your smaller items in the two side mesh pockets and external zipped pockets. Has elastic cords on the outer layer of the bag for you store things you might not be able to put in your bag or might not want to put in. Straps are padded for your comfort when carrying this durable bag. Opening is a bit restricted. Perfect for those who need just a cheap backpack cooler bag. Despite the cheap cost, it doesn’t mean its functionality is jeopardised. Still does a good job on keeping your food cool, as well as carry your water bottles, smaller items, and coats. The main compartment is insulated, so that’s one less thing to worry about! This bag is also on your side when it comes to comfort – the straps are padded for your comfort. Keeping your food and drinks cool in warmer temperatures can crucial especially if it involves food that can go off if it’s not kept in the correct temperature. An insulated backpack cooler bag is great for that purpose. There are usually also several compartments which is ideal for keeping your food separate to non-food items, or keeping different types of food such as meat and fruit in separate compartments.